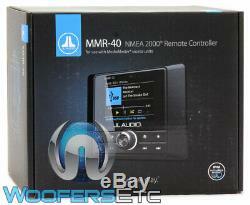 MMR-40 - JL Audio Wired Marine Remote Control for MediaMaster Receivers. NMEA 2000® certified (cables not included). 2.8 color LCD display. 8 pushbuttons and a 3-way rotary knob. Independent day/night display themes and lighting controls. IP66 rated for water resistance. Front-panel measurements: 4-11/16"W x 3-3/4"H x 1 D. Mounting hole measurements: 3-11/16"W x 3-1/16"H x 2D. You will be issued a Return Authorization Number. In order to maintain an inventory of 100%, Brand New, A-Stock, untouched products, all sales are final. We ask that you please be sure you are ordering the correct product. The item "JL AUDIO MEDIA MASTER MMR-40 WIRED MARINE REMOTE CONTROL for MEDIA MASTER UNITS" is in sale since Thursday, March 21, 2019.